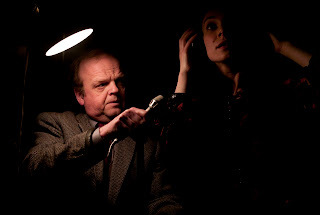 Peter Strickland’s Berberian Sound Studio is a bizarre, aurally inventive, yet slightly underwhelming thriller about a British sound designer, Gildero (Toby Jones) who is hired by an Italian production company to create the sound design/effects for their latest giallo horror film. However, the job slowly begins to drive Gilderoy insane. This is a fascinating film because none of the film that Gilderoy is working on is shown. Only the sound effects for the film are shown while being created and scenes are described. These give more than enough information as to what is happening in the film and is a clever substitute for gore and violence. Scenes like this and the general eerie sound design contribute to the mood of this atmospheric film. Toby Jones is superb as Gilderoy. Gildroy is a quiet, introverted man and Jones masterfully captures this. Jones is one of the most underrated actors working today and it is great to see him in a leading role as perfectly fitted to him as this. His performance is the strongest part of the film and is one of the reasons it stands out over other new thrillers. New thrillers generally don’t rely on strong acting, but this one would have failed without it. It would have turned into an exercise in overdramatic arthouse excess. As well crafted as this film is, it is held back from greatness because of a lack of momentum. The film has such an interesting premise but does not build up to as much as I would have hoped. It is nearly devoid of any real chills and does not get as weird as it could. The final 20 minutes plunge straight into Lynchian territory, but it is s straight plunge, not a slow build. The surrealism is largely unearned and borders on incoherence. That being said, this is a film worth seeing for the pure originality of its craft and Toby Jones’ masterful performance. It is rare to see a horror/thriller that attempts to be this original and clever. Because I felt as if I did not fully grasp every layer of this multilayered piece, I will happily revisit it in the future. In this day and age where horror films rely on massive amounts of torture and gore, it is refreshing to see one that is gore-less and lacking any violence. While Berberian Sound Studio will not be for everyone, those that love something different and/or 1970s giallo horror films should seek this film out. It is now available on VOD.